Sydney is not only one of my favorite cities in the world (I stayed and worked there for 6 months a long time ago) but aThemes has created an attractive and beautiful WordPress theme named Sydney. Sydney is a flexible and modern theme with plenty of customization possibilities. Meaning you can create a wonderful website with this theme and a great online presence. I really like aThemes and Charlie Livingston as a designer. He is a creative designer and has created numerous popular free themes such as Moesia, Alizee and Intro. And now his latest theme Sydney, which surely will become a popular theme many people will use on their WordPress sites. 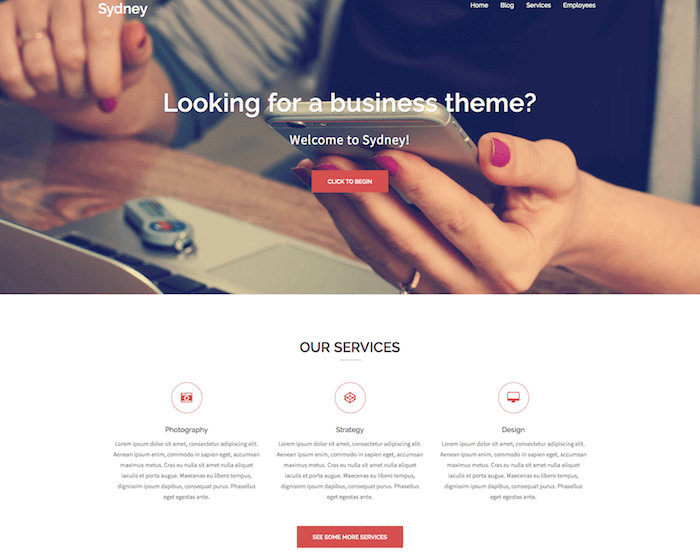 Sydney is a perfect business theme with features such as theme options located in the theme customizer. There you can easily customize your front page, blog layout, change the colors as you wish and much more. Sydney comes with fully responsive and adaptable design. Meaning the theme is mobile-friendly and work great on all devices. It doesn’t matter if your visitors and readers using a mobile phone, tablets or computer. You have everything covered. Sydney is a feature-rich WordPress theme with lots of features normally only found in premium themes. Present your featured content with full-width stylish images. Choose between fullscreen slider or a full-width static header image. The theme comes with support for Parallax backgrounds. You can add Parallax background images for every section and watch it come to life as you scroll.